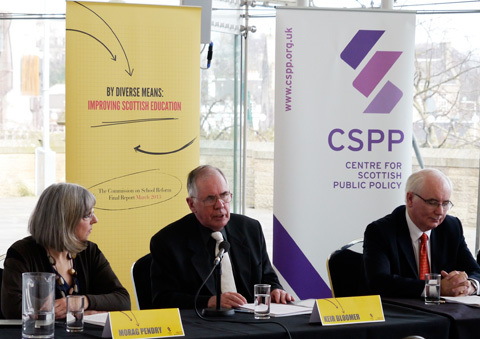 Reactions to "By Diverse Means"
Yesterday's launch of the cross-party Commission's report was an intriguing event. Above you can see three of the four panellists: Morag Pendry, Keir Bloomer and Frank Lennon, with Councillor Paul McLennan (SNP) out of shot to the right. There was a lively audience, a broad area of interest and the event was better attended and attracted more questions than expected. Both think tanks, Reform Scotland and CSPP now have the report PDF as a download from their websites, but I recommend the CSPP website because they also have an update on recent coverage here. What it doesn't yet give you is the link to the radio coverage which, as always, was in more depth than television. For the next six or seven days, you'll find Gary Robertson's interview with Keir on Good Morning Scotland for five minutes starting after about 2 hours 22 minutes. The Commission was healthily cross-party, with some members strongly identified with each of the four main parties, including two councillors and former Education Minister Peter Peacock. An interesting aside that emerged only in the Q&A was that although there was "robust discussion" on occasion, the debates never split along party lines. This heartwarming fact is reflected in the fact that yesterday all four parties issued statements welcoming the report. Now the key question is whether the Scottish Government will do anything effective about implementing it. This page contains a single entry from the blog posted on March 5, 2013 12:03 AM. The previous post in this blog was By Diverse Means: the Commission on School Reform . 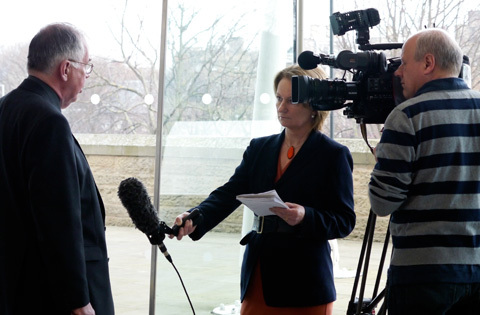 The next post in this blog is Does Newsnight want Michael Gove to run Scotland's schools?.